The Brazilian scored a treble in the 4-0 win over Huddersfield. Sports Mole looks at how out-of-form top-four hopefuls Tottenham Hotspur could line up against Crystal Palace for the first match in their £1bn new stadium. Sports Mole rounds up the latest injury and suspension news for Tottenham Hotspur ahead of their first match in their new stadium - against Crystal Palace on Wednesday. Sports Mole previews Wednesday's Premier League clash between Tottenham and Crystal Palace, including predictions, team news and head-to-head records. Sports Mole looks at how Tottenham Hotspur could line up for Saturday's trip to face Southampton as they aim to keep clear of the chasing pack in the top-four race. Sports Mole provides team news, predicted lineups and a full preview of Saturday's Premier League fixture between Southampton and Tottenham Hotspur. Sports Mole rounds up Tottenham Hotspur's latest injury and suspension news ahead of their trip to Southampton as Dele Alli pushes for a return after 10 games out. Sports Mole looks at the latest injury and suspension news for Tottenham Hotspur ahead of Tuesday's Champions League game with Borussia Dortmund. Ahead of the Champions League last-16 second leg between Borussia Dortmund and Tottenham Hotspur, Sports Mole looks at how Spurs may line up. Sports Mole provides team news, predicted lineups and a full preview of the Champions League last-16 second leg between Borussia Dortmund and Spurs. Sports Mole looks at how Tottenham Hotspur could line up for Saturday's North London derby against top-four rivals Arsenal at Wembley. Sports Mole looks at the latest injury and suspension news for Tottenham Hotspur ahead of Saturday's Premier League encounter with Arsenal. Chelsea ease the pressure on Maurizio Sarri by registering a 2-0 victory over Tottenham Hotspur in Wednesday's Premier League clash at Stamford Bridge. Ahead of Wednesday's Champions League match between Tottenham Hotspur and Borussia Dortmund, Sports Mole looks at how the home side could line up at Wembley Stadium. Sports Mole provides team news, predicted lineups and a full preview of Sunday's Premier League meeting between Tottenham Hotspur and Leicester City. The midfielder was nursing an ankle injury heading into the season. Sports Mole rounds up the latest injury and suspension news for Tottenham Hotspur ahead of their Premier League clash with Leicester City. Ahead of Wednesday's Premier League game between Spurs and Watford, Sports Mole looks at how Mauricio Pochettino's side could line up at Wembley Stadium. The two sides do battle for a place in the final. Ahead of Thursday's EFL Cup semi-final between Chelsea and Tottenham Hotspur, Sports Mole selects a strongest combined XI from the two squads. Sports Mole provides team news, predicted lineups and a full preview of Thursday's EFL Cup semi-final encounter between Chelsea and Tottenham Hotspur. Tottenham's injury concerns deepened on Sunday. 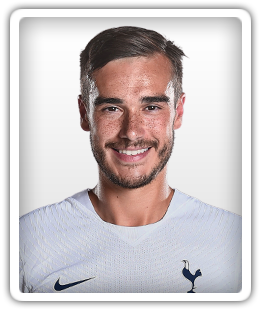 A last-gasp header from Harry Winks gives Tottenham Hotspur a 2-1 victory over Fulham in Sunday's Premier League clash at Craven Cottage. Relive Sports Mole's live coverage as Tottenham Hotspur come from behind to earn a 2-1 victory over Fulham in Sunday's Premier League game at Craven Cottage. Ahead of Tottenham Hotspur's trip to Fulham on Sunday, Sports Mole looks at how Mauricio Pochettino may set out his side. Sports Mole provides team news, predicted lineups and a full preview of Sunday's Premier League meeting between Fulham and Tottenham Hotspur.